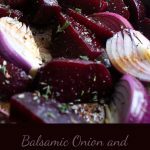 Balsamic onion and beetroot bake. 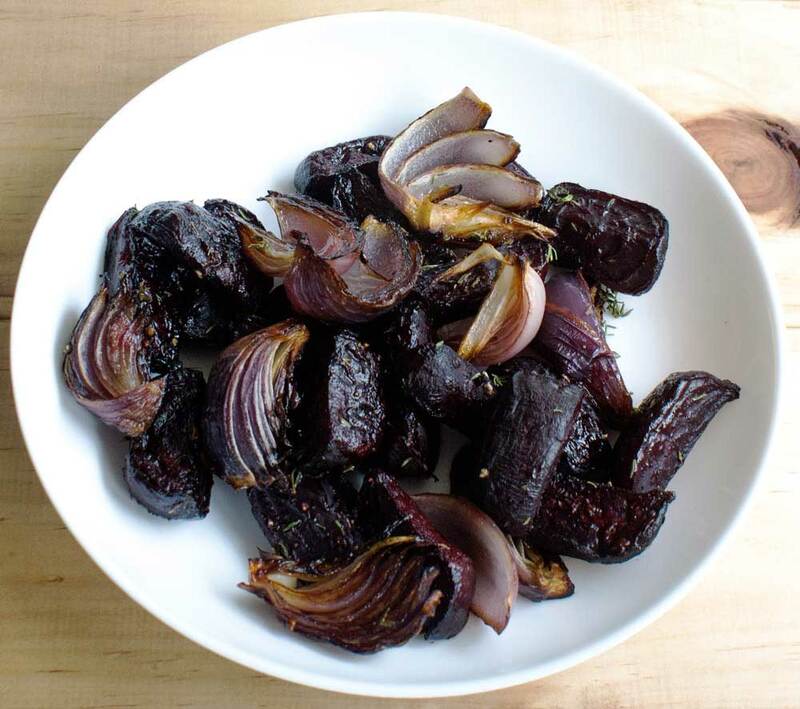 A deliciously and naturally sweet side dish that is perfect for serving with grilled meats. Some food just looks beautiful, the colours sing and the dish is like a picture on the plate. This balsamic onion and beetroot bake is almost that dish. When you prepare it and get it all in the roasting tin it is a glorious sight, the deep purple vegetables are flecked with greeny blue thyme. Then you add a gloss of oil and a dark brown drizzle of balsamic vinegar and it looks like a piece of modern art. I think these pictures are some of my favourite food prep photos ever. When I took them I wanted to get them framed and put it on my kitchen wall (in fact I may still do that!!!). Then I cooked the dish! I was so disappointed, so disappointed that I almost didn’t share the recipe with you. My glorious piece of food art had turned into what looked like lumps of charcoal. At first I thought I had burnt it, but the beetroot was soft and the onions were sweet and caramelised. It wasn’t burnt it just wasn’t pretty. So I am sharing more photos of before it went into the oven 🙂 this dish is beautiful before it is cooked and delicious when it is cooked. 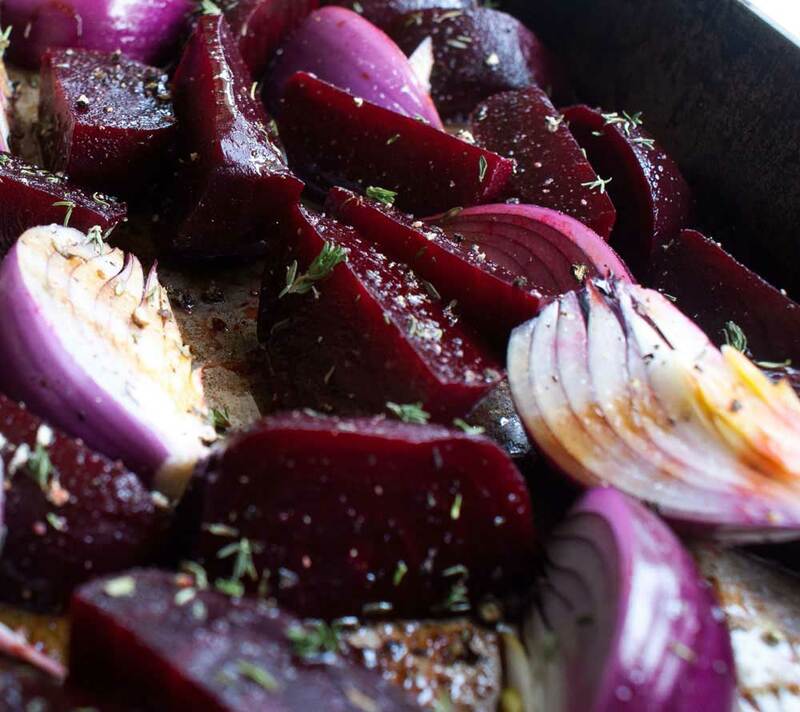 The sweet beetroot and onion are roasted with balsamic vinegar, oil and fresh thyme. I like to add a drizzle of maple syrup, but that really isn’t necessary. This is a delicious dish without it, but I just love maple syrup glazed veg! Preheat oven to 180°C/160ºC fan forced/Gas mark 4. Peel the onion but make sure you leave the root intact. 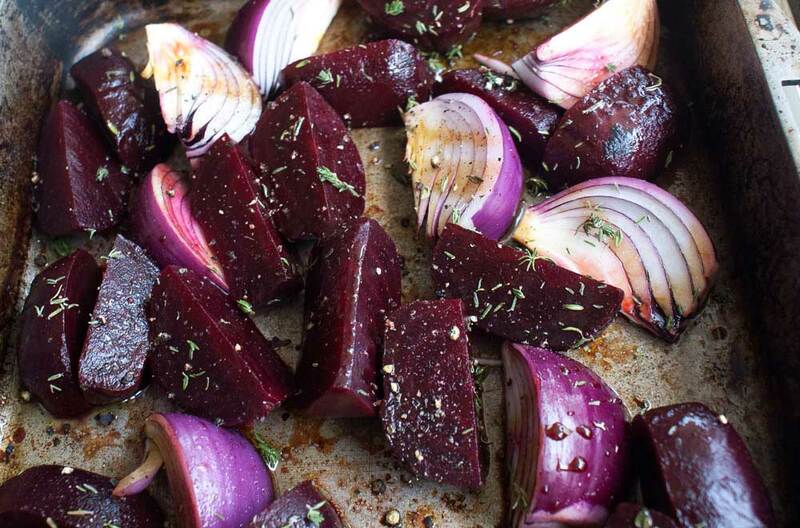 Place the beetroot and red onion into a baking dish. Pour over the balsamic vinegar and olive oil (and maple syrup, if using). This is so pretty!!! I love it. Oh thank you Caroline. It was pretty I almost didn’t want to cook it! I love roasting vegetables! It gives them a glorious taste. I love the addition of the maple syrup! It’s always great to have something sweet to counteract the acidic taste of the balsamic. This looks scrumptious, and I can’t wait to try this! What a wonderful and fresh idea. Beets are one of my favorites! Thank you for stopping by Tina.